Most of the time, this casual + chic kind of outfit is my absolute favorite. Don't get me wrong, I love a good skater skirt too, but there's just something about an outfit you can be comfortable in all day long that speaks for itself. I adore the coziness of this baggy sweater (with gold detail, of course) paired with classic skinnies. Not to mention these fab accessories that I've had on major repeat lately-- this clutch from Victoria Khoss is such a fun color (go tigers!) and perfect for Fall. 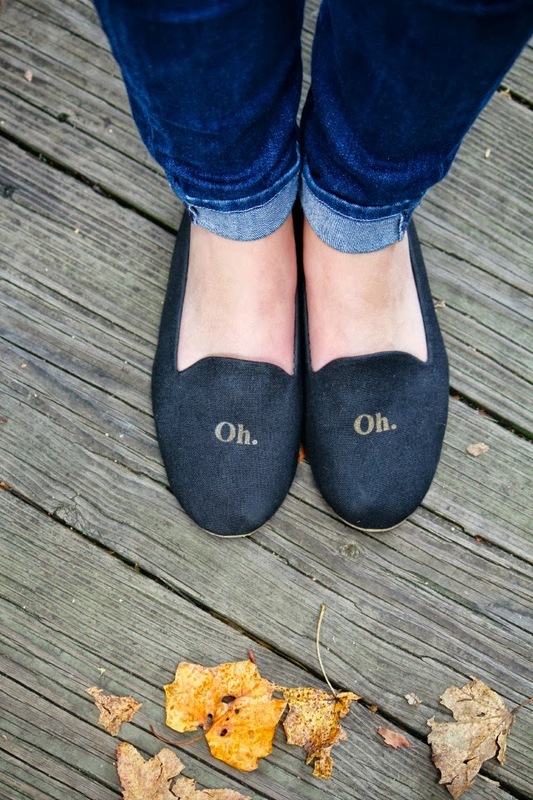 Also, could you die over these flats? So me and completely practical, all in one little flat. Love sweater weather! Such a great look! Those shoes are so cute! So lovely! Such a great fall, comfy look! Love this casual look, and how adorable are those flats? Love them!!! Ah! Those shoes!!!! Adorbs... great comfy outfit. Your shoes cracked me up! I love this look. This is my favorite style too- casual, yet classy. And those shoes? Too cute. This outfit is literally the most adorable thing ever, those shoes!!!!! This outfit is literally the most adorable thing ever, those shoes!! !